It's never a good idea to be overly-relient on technology while traveling Look up words quickly and easily with this great little Arabic dictionary. 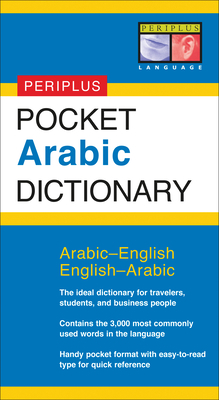 Intended for use by tourists, students, and business people traveling to the Middle East Pocket Arabic Dictionary is an essential tool for communicating in Arabic and a great way to learn Arabic. It features all the critical Arabic vocabulary appropriate for beginning to intermediate students. It's handy pocket format, and easy-to-read type will make any future trip to the Arab world much more manageable. In addition to being an excellent English to Arabic dictionary and Arabic to English dictionary, Pocket Arabic Dictionary contains essential notes on the Arabic language, Arabic grammar and Arabic pronunciation. All Arabic words are written in a Romanized form as well as Arabic script ( al 'arabiyah ) so that in the case of difficulties the book can directly be shown to a native Arabic speaker. The 3,000 most commonly used words in the Arabic language. Romanized Arabic and Arabic script ( al 'arabiyah ). An introduction to and history of the Arabic language. A guide to pronouncing Arabic correctly. Other books from this bestselling series you might enjoy are Pocket Japanese Dictionary, Pocket Tagalog Dictionary, Pocket Korean Dictionary, Pocket Vietnamese Dictionary, Pocket Arabic Dictionary, Pocket Mandarin Chinese Dictionary, Pocket Cantonese Dictionary, Pocket Cambodian Dictionary, Pocket Thai Dictionary, Pocket Indonesian Dictionary, and Pocket Malay Dictionary. Dr. Fethi Mansouri is a lecturer in Arabic and Middle Eastern Studies at Deakin University, Melbourne, Australia. He has previously taught at People's University in Beijing and the Australian National University.